When you search a lot during the day it is possible that the results you are getting are influenced by previous results, because of stored cookies on your machine. If you are an SEO you want to limit those results to what a typical user might see. You can change your search to see what those users see, if you 'depersonalize' your search. 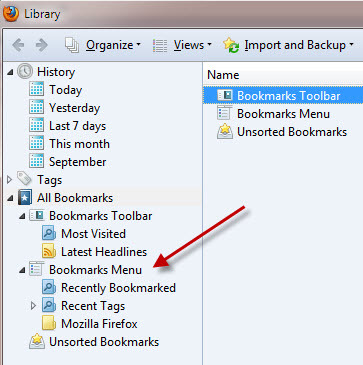 I'm generally using Firefox so I am going to go through the process of this setup using Firefox.From the Bookmarks -> Show All Bookmarks. 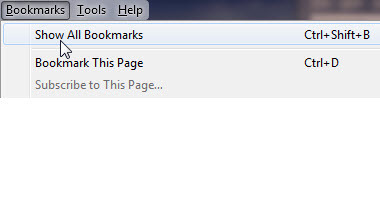 Here i am choosing Bookmarks Menu and Right Clicking on it, but in reality you can choose any Folder to try this. 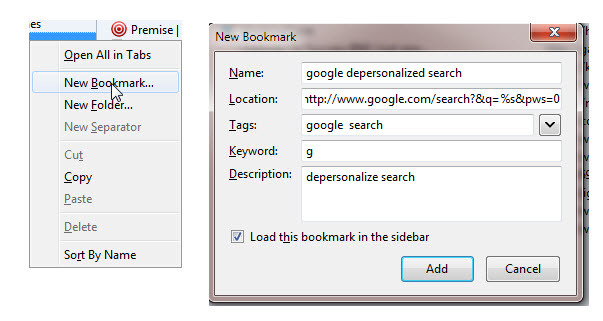 You are creating a new bookmark by right clicking and choose New Bookmark. At this point you will be able to fill out the fields that are shown in the New Bookmark area. and use something mnemonic for the keyword like the letter 'g' for For Google. At this point you are ready to use the bookmark by typing into the search bar beginning with the Keyword you used ( 'g' for example).